The recent police crackdown adds into a long of list of state sponsored repression on free speech since Erdogan came to power. 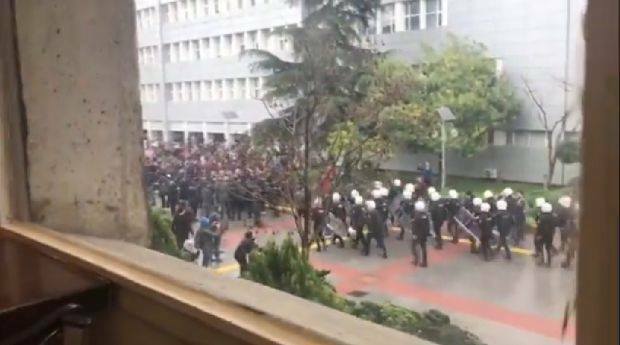 Just days after Turkish President Recep Tayyip Erdoğan called the anti-war protesters in Boğaziçi University(or Bosphorus University) “terrorists”, police launched a crackdown in the university campus. On Monday, police raided the homes and dorms of students, and detained three belonging to the Marxist Opinion Society. According to some reports, the total number of students detained were seven. This was the second wave of police repression against the university students. Earlier, on March 22, students mostly belonging to the Marksist Fikir Toplulukları (Community for Marxist Ideas, MFT) and the Sosyalist Emekçiler Partisi (Socialist Labourer’s Party, SEP) were detained by police in connection with the protest against the ongoing Turkish invasion in Afrin. On March 19, when some students were distributing Turkish delight- dubbed as ‘Afrin Delight’-- to honour the soldiers who died in the anti-Kurd operation in Afrin, the anti-war activists organised a counter protest. The protesters demonstrated with a banner reading “invasion, massacre cannot be marked with Turkish delight”. In January this year, Turkey launched operation ‘Olive Branch’ in Syria’s Afrin to push out the Kurdish forces from the area. “We will catch those marginals by the ear and hurl them to the ground,” he threatened during an address to his ruling Justice and Development Party’s Beyoglu branch in Istanbul. Visuals and eyewitness accounts point to police brutality inside the campus, with students being blindfolded, beaten and dragged away by anti-terror police. 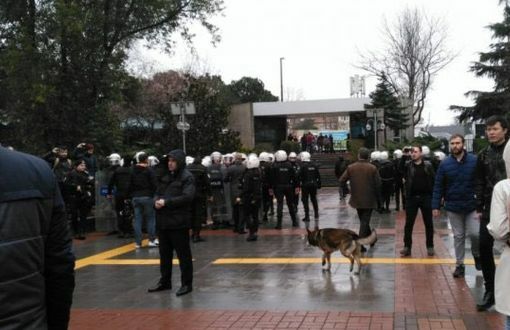 According to reports, the atmosphere at Bogazici remains tense with police patrolling the campus grounds as rumors of further detentions continue to swirl. "A special project is being implemented at Boğaziçi at the moment. A rush has been started for the detention of students and academics. Boğaziçi is one of the most deep-rooted universities of Turkey. Students enter this university after they manage to be among the most successful 1 percent. They know what to defend very well, too. Defending peace should never be a crime." Two academics from Boğaziçi University, among 166 others Turkish academics were earlier charged with "propagandizing for a terrorist organization" for signing the declaration "We will not be a party to this crime" prepared by the Academics for Peace in 2016. The signatories of the declaration calling on state of Turkey to end state violence and prepare conditions for negotiation. Signatories included Noam Chomsky, Judith Butler, Etienne Balibar and David Harvey among 1,600 others from Turkey and abroad. The full text of the declaration can be found here. Most of the academics were charged with with "terrorist organization propaganda" under Article 7/2 of the Turkish Anti-Terror Act. Three academics were sentenced to 1 year and 3 months in prison, and the sentences were suspended. The recent police crackdown adds to a long of list of state sponsored repression on free speech since Erdogan came to power. Since the failed coup in July 2016, Erdogan’s purges have led to suspension or removal of nearly 50,000 educational staff members, and some 37,000 people have been jailed with a pending trial. In terms of media freedom, according to Committee to Protect Journalists, Turkey is one of the worst countries. Under Erdogan, Turkey currently hold largest number of journalists in jail than any other country. Kurdish political prisoner Zülküf Gezen, who was incarcerated in the Tekirdağ Prison in Turkey, took his life on Sunday, March 17.